Combine honey, brown sugar, vinegar, cinnamon, nutmeg and cloves. Bake bone-in ham at 350 degrees F for 1 hour to heat through, basting with honey sauce occasionally. Place in broiler to glaze top. 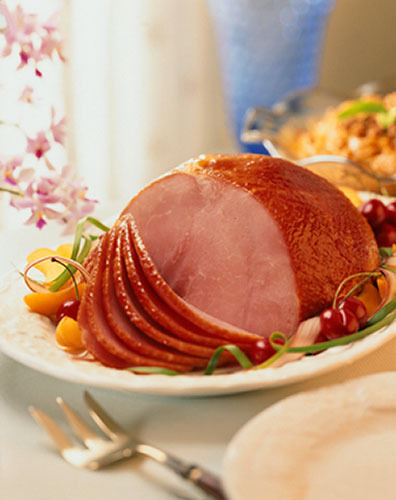 To cook boneless ham, slice half way through at 1/4-inch intervals, then tie with string. Place in roasting pan. Heat honey sauce and pour over ham to marinate for 24 hours before baking. Then bake at 350 degrees for 1 hour or until heated through. Glaze top under broiler, if desired.